Exposure introduces CD player with DAC and unique loader | What Hi-Fi? In 2017, Exposure Electronics launched the ‘XM’ series of hi-fi components, growing to include a phono stage, integrated amplifier, preamplifier, mono power amps and a headphone amp. Allegedly thanks to customer request, the XM line-up now features a CD player. Who said the CD spinner was dead?! 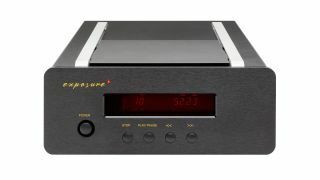 The half-width Exposure XM can be used as a fully-fledged CD player, or solely as a CD transport connected to a preamp or integrated amp thanks to its (24-bit) DAC and digital coaxial and optical outputs. Exposure has implemented engineering to get the optimum sound quality from its design, including a crystal clock reference and dedicated power supply regulator for the transport and audio stages, ensuring low jitter performance. A large toroidal power transformer has separate windings for CD transport mechanism and audio stages, and the all-aluminium casework and extruded front panel help to control unwanted resonance. The CD display can be turned off using the supplied remote control, too. The Exposure XM CD player is available now in a choice of black or titanium finishes, costs £1200 and has a 3 year warranty. We don't get many CD players through our test rooms doors, but we're always keen to add to our recommended list. Here's hoping the Exposure can make an impression when up against the class-leading Cyrus CDi, then.